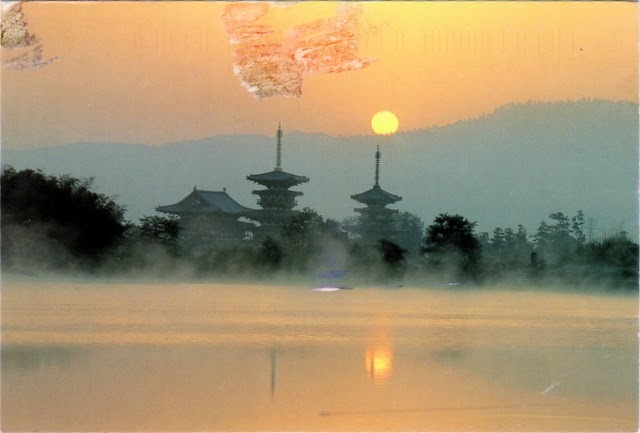 Postcard JP-616307 from Japan shows Yakushi-ji (薬師寺) in Nara, one of the most famous imperial and ancient Buddhist temples in Japan. The temple was established in 680 C.E. (the Common Era) and was name after Yakushi Nyorai (藥師琉璃光如來), "the Medicine Buddha", who was one of first Buddhist Deities to arrive in Japan from China. Yakushi-ji is one of the eight places that are collectively recognized as the "Historic Monuments of Ancient Nara" World Heritage Site by UNESCO in 1998.